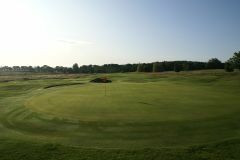 Founded in 1892, Newcastle United Golf Club predates the football club of the same name, and is home to one of the most enjoyable courses in the city area. The layout was mapped out by Tom Morris Senior, and it remains a good test to this day. Easily accessed from the town centre, this highly regarded club is an ideal stop on a good Newcastle golf tour.